QMobile, a Karachi based consumer electronics company markets smartphones in Pakistan. It is one of the largest smartphone brands in Pakistan with an estimate of one million mobile phones sold monthly. The company used to introduce many budget-friendly smartphones. Recently, a new model has been presented by the company. Qmobile Fire is one of the mid-rangers with Non-Stop Entertainment. 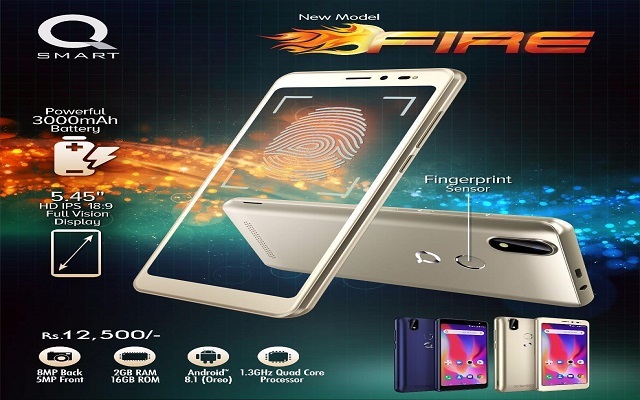 The newly Introduced phone, Qmobile Fire features a 5.45″ HD IPS full view display. A large display allows the users to Explore More, Watch more, Play more! It allows the users to enjoy flawless multitasking experience. The phone sports a 1.3GHz Quad-core processor. In addition to that, the smartphone has 2GB RAM, 16GB ROM. It runs Android Oreo straight out of the box. The phone comes with an 8MP rear camera with Autofocus and LED flash. In addition to that, there is also a 5MP selfie snapper to capture your memorable moments. It also supports camera features like face beauty, HDR, panorama, filters, smile and face detection etc. Furthermore, the phone features an in-Built Fingerprint sensor too. QMobile Fire allows you to have total security and convenience with a single swipe only. The users can easily unlock the smartphone and access all files securely with just one touch. OTG support as well. The users can have expandable memory support up to 128GB. Qmobile Fire Price is only in Rs.12500/-. It comes with 1 Year Digicom after sales warranty as well. Qmobile Fire Color Options Include metallic Gold and Blue. Its a mid-ranger all packed with some good specs. So, if you are searching for a phone with good specs and low price, it is definitely a fine option.